Do I really need to explain? A very solid case can be made for this being the best soundtrack for anything, ever. OK, that was too easy. I’ll give you another one. The OP on YouTube, for reference. The stylish cuts, subtle effects, and the way the song sounds combine to give the impression of a series featuring a diverse cast full of convincingly deep and emotional characters along with a good dose of both action and mystery. Instead, we get tl;dr: The Animation. Did it not occur to these people that creating an adaptation of a printed work in a visual medium does not consist of putting the entirety of the printed work, word-for-word, into said visual medium? Well, I must agree with you on MF being one of the best shows of 2008. I haven’t seen Index yet, but judging from the OP, you’re right. The show builds up a awful lot of hype for the OP… but hey, it’s part of the marketing scheme right? Nice flashy OPs and popular songs make people perceive shows as being better. What? You just said two things everyone has said, with like zero originality, and it’s not even tl;dr! C’mon, Roxas, this isn’t a post! It’s two tweets! 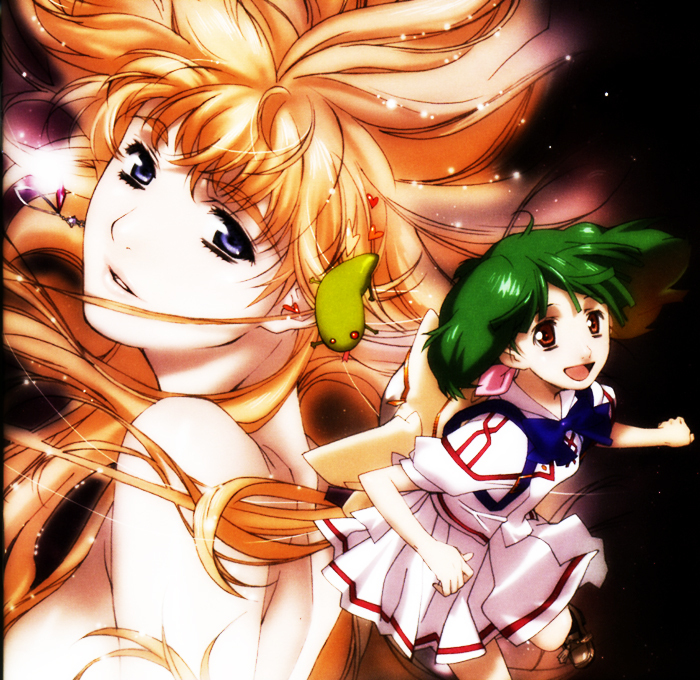 In any event, Aria the Origination’s soundtrack can trump Macross F’s anytime as far as I’m concerned. Translation: yes, you do need to explain because you’re not expressing the unanimous opinion of everyone reading this blog. Okay, so there’re these two or three heavy-duty Macross fanboys rampaging around the ’sphere the last six weeks and now suddenly people are calling Frontier a good show? I thought it was crystal clear to just about everyone that the show had serious failings (like a crap plot, a lack of likable/believable characters, and a cop-out ending) and that it was nowhere close to being one of the best shows of 2008. Re: the second part - he said it, not me :P I haven’t sorted out what I’d call the “best shows of 2008″ yet, because I still need to go back and look at what actually aired in 2008. Anyway, try to keep this up and hopefully things will get more inspired and more interesting as the days progress. Macross F’s soundtrack is nice, but personally I didn’t find it all that interesting, for whatever reason. Personally, I like True Tears’ OST more than Frontier’s..But that’s just my opinion..
Agree with the guy above. Some of the tracks in True Tears OST are better than the ones in Macross Frontier (Ichijin no Kaze). But overall, Macross Frontier wins, hands down..
You see, the funny thing is, they still left out stuff in Index. Quite a lot of stuff. Just goes to show how much those bastards talk in the book. While I seriously like Macross Frontier’s music, I seriously HESITATE declaring it better than anything, anything out there. >>Okay, so there’re these two or three heavy-duty Macross fanboys rampaging around the ’sphere the last six weeks and now suddenly people are calling Frontier a good show? I thought it was crystal clear to just about everyone that the show had serious failings (like a crap plot, a lack of likable/believable characters, and a cop-out ending) and that it was nowhere close to being one of the best shows of 2008. Polite arguments abound in the comments section. Having not seen MF, I can’t speak for it besides the few Kanno pieces I’ve heard. I love Kanno’s arrangements/orchestration, they’re stellar and gorgeous. I don’t like her compositions though, they sound bland and recycled to me. She is pretty restricted though, her writing for specific lengths ‘n all, but I dunno. Seems that MF’s incorporation of pop singers gives Kanno another excuse to write big, magnificent orchestrations. If Macross didn’t have singers as a “central plot device” (or w/e we call it), would large, orchestral pieces be as effective? You could say that the presence of pop singers necessitates..uh..Kanno-esque pieces. I like Aria’s music ’cause it’s really fitting. It’s simple, non-intrusive, easy to listen to (especially the OP’s/ED’s). The music sources - Senoo Takeshi and Choro CLUB - complement the anime really well, not in that there are crucial performers within the anime to which they must “accompany” (that’s an interesting way of viewing Kanno, as a kind of “meta-accompanist”), but that they succinctly capture all of Aria within their very short OST pieces. re: the guy above - IMHO True Tears ST was sooooooooo cheesy…in a good way. My favorite ST’s are probably Eureka 7, G Gundam (yes, YES), Gundam 08th MS (YES, YES), Kurenai/Natsume Yuujinchou. oh, sorry for the Serious Response. Trolling on people’s soundtrack awards is lame. I mean, that is why the top 6 anime-related CDs sold on Amazon.jp this year are all Macross Frontier items right… the masses have spoken, I think Aria’s soundtrack can go back to rolling to scenic footage of Venezia knockoffs and enjoy its niche status. Heck, lolikit just dissed Kanno Yoko. That’s like hating on kitten, orchestra music and hats all at the same time. When did I diss her? You seem to think I diss her and Maaya pretty frequently but I can assure you that is never my intention nor the meaning of the words I spew. Furthermore I didn’t troll, as ghostlightning pointed out on Twitter.